How to effectively communicate with one of the busiest organizations in the world. CEA, the trade association for the consumer electronics industry, had a message to deliver to Congress. However, with a group of people who are inundated every day with requests and information, this task was easier said than done. The CEA had to cut through the clutter and grab Congress’ attention. The message needed to be compelling; the medium had to be innovative. 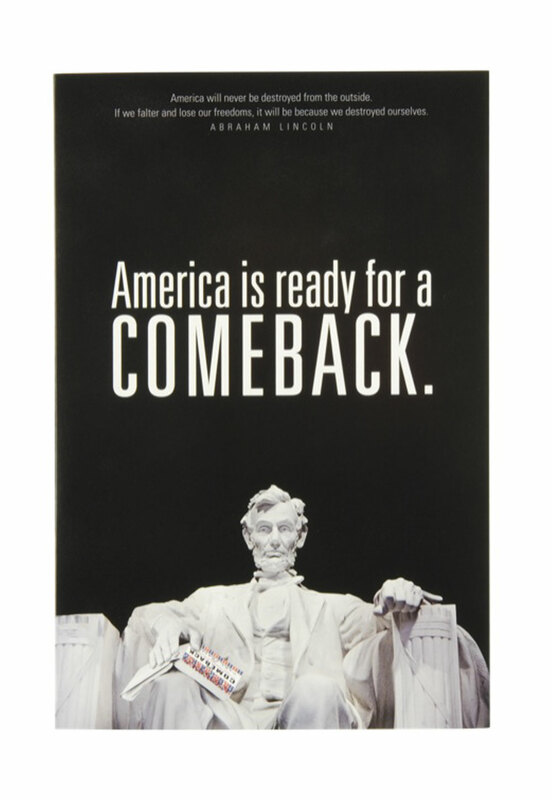 With a message focused on innovation and technology as the cornerstone to America’s recovery, Americhip’s patented Video in Print® technology was the perfect fit. 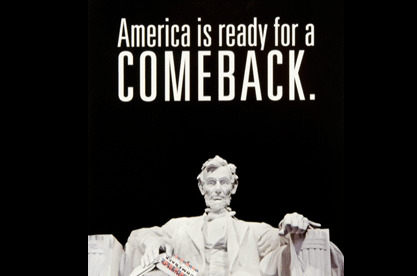 What better way to focus Congress on innovation than to deliver the message in the most innovative marketing form possible. 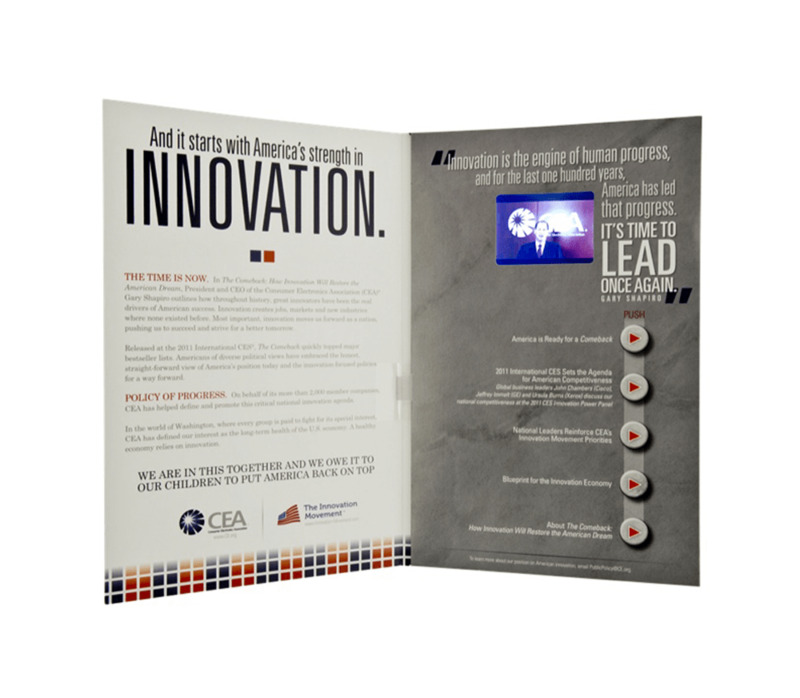 The sleek 6” x 9” video brochure allowed Gary Shapiro, CEO of the CEA, to speak directly to the members of Congress. Among the videos programmed into the video brochure was a speech on innovation by President Obama, along with excerpts on the future of global business from the CEOs of Cisco, Xerox and GE. When you need your message to be heard by busy influencers, stakeholders, consumers or even congressmen, that message should be delivered through the power of Video in Print®. 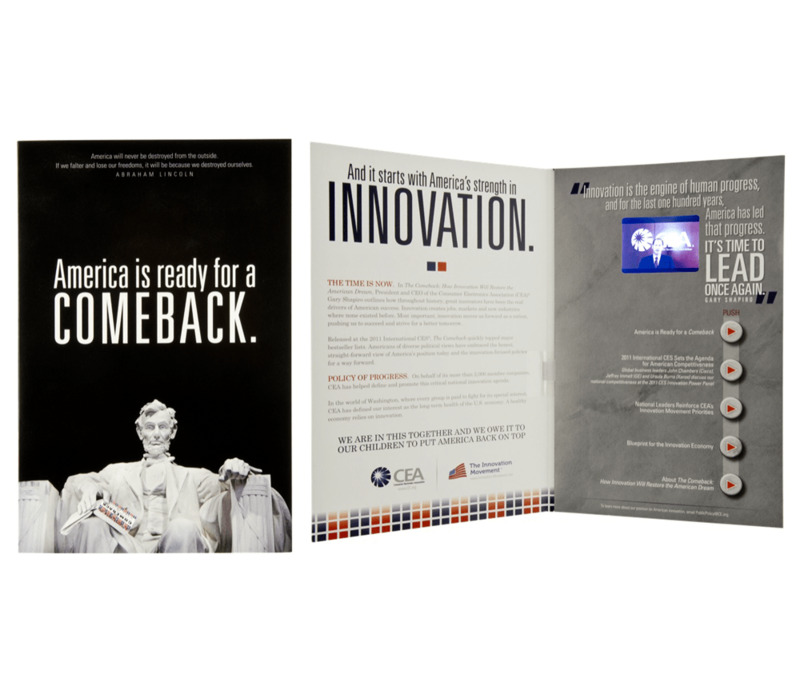 On the week the video brochure hit the market, Capitol Hill was abuzz with talk about one of the most innovative marketing tools ever used to lobby Congress. The story was covered by dozens of media outlets throughout the country and won the prestigious PR News Platinum Award. Additionally, in a primetime segment, MSNBC aired a feature on the video brochure and the role it would have in the future of political discourse.